Scotland 2018: 3) It’s more than a famous film location, but … pass the coconuts. Being a photo-heavy travelog of our 2018 trip to Scotland. We had a lovely breakfast at the B&B, and for the first time I had real, actual, haggis … and discovered that I quite liked it. It was our host’s own home-made, and the slice I had with breakfast was buttery, crunchy, full of flavor. Yum. The haggis I had a couple of additional times during the trip was similar, and likewise quite tasty. Following that, we packed up, then went up to Stirling Castle, just up the hill. Stirling is a very substantial royal castle, on the order of such Edward I castles in Wales as Caernarfon or Conwy. But as with a number of additional castles in Scotland, Stirling had been renovated and updated repeatedly after the medieval period, serving different functions both personal and military up until almost the current time. Nothing quite like commanding the heights. King’s and Queen’s Knots, seen from the walls of the castle. It was good that we were able to get there first thing, because by the time we had enjoyed our tour of the castle, the crowds were starting to get thick. We headed off on our way. I love that they sell coconut halves there. At the start of the film, King Arthur (Graham Chapman) and Patsy (Terry Gilliam) approach the east wall of Doune Castle and argue with soldiers of the garrison. The song and dance routine “Knights of the Round Table” at “Camelot” was filmed in the Great Hall. The servery and kitchen appear as “Castle Anthrax”, where Sir Galahad the Chaste (Michael Palin) is chased by seductive girls. The wedding disrupted by Sir Lancelot (John Cleese) was filmed in the courtyard and Great Hall. The Duchess’ hall was used for filming the Swamp Castle scene where the prince is being held in a tower by very dumb guards. The Trojan Rabbit scene was filmed in the entryway and into the courtyard. As well as also having served in other films and television shows, including Game of Thrones and Outlander. Recognize any of these shots from the castle? Sir Galahad almost slept here. We’re knights of the Round Table, we dance whene’er we’re able. We do routines and chorus scenes with footwork impec-cable. In his own particular idiom. From Doune we headed northwest through Loch Lomond & The Trossachs National Park to Fort William at the foot of Ben Nevis. Driving through the beautiful Trossachs was wonderful, and reminded me very much of the area around Snowdon in Wales or parts of the American West in the Northern Rockies. Three weeks in Wales, Part 10: Welsh Rover. Part 1. Part 2. Part 3. Part 4. Part 5. Part 6. Part 7. Part 8. Part 9. While we’d had exceptionally nice weather through most of our trip, the next day we woke to more low-hanging clouds, light rain, and mist. In other words, characteristically Welsh weather. We next had an Air B&B up outside of Caernarfon. Charming place. Lots of character. Bit too much for my tastes, actually. Would have been fine if I were a grad student again, but I’ve now come to like more luxury when on vacation. Like a bed which isn’t a foot off the floor. A bathroom which isn’t down the hall, up some stairs, then down another hall. And a door which *doesn’t* lock from outside the room. It made me … uncomfortable. At least the host was pleasant, though in a way which a murder mystery writer might describe. Yes, I have an over-active imagination, but still. We stayed the one night, but high-tailed it to a conventional holiday hotel elsewhere in the area the next day. Even The Village needs maintenance work now and again. OK, this is hard to make out. But there in the middle of the image is a modern security camera. Given how Portmeirion was used as the setting for The Prisoner, with it’s all-encompassing monitoring, I just thought it a bit ironic to actually see this. After a nice afternoon in Portmeirion we went up to Caernarfon and strolled around a bit. I was surprised at just how much the city shuts down at the end of the business day — they really roll up the sidewalks. But there was still one pub going strong, at least: The Anglesey Arms. Where we saw this. I thought the paint job would appeal to a number of my friends. 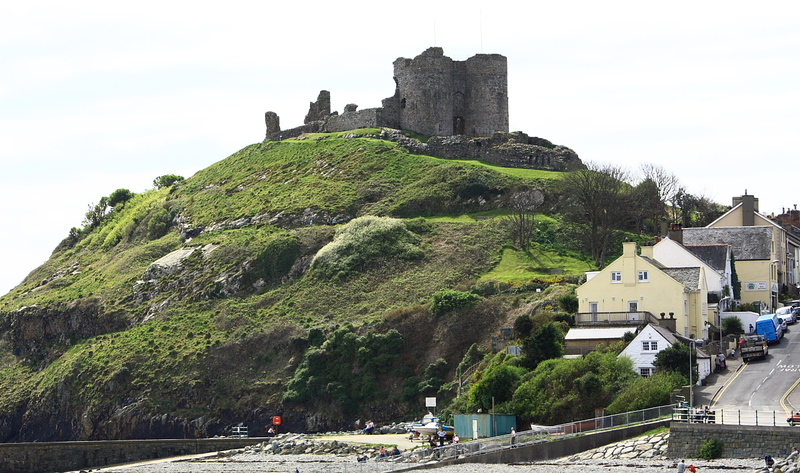 The next morning we decided to go out onto the Llŷn Peninsula, first going to Criccieth Castle. Here’s the description of Criccieth from St Cybi’s Well — see if you think it fits with the image from Castle Wales below. Darnell went across to the exit into the castle grounds proper. The path turned left, then right into a copse of trees. When he emerged from these, the massive gatehouse seemed to loom directly overhead. The path cut up the hill at an angle on the north side, climbing steeply, then switched back before coming around to the front of the gatehouse. There was little doubt that when the castle was in operation, taking this path would mean that any attackers would be under constant fire from arrows, bolts, and heavy stones coming from the walls and the outer gatehouse. Trying to go straight up the hillside would have been even worse, because while it was a shorter path, it was much more precarious footing, and still under direct fire from the outer gatehouse tower and curtain wall. And of course, if you made it past the outer gatehouse, then you had to contend with the huge inner gatehouse, a massive structure of twin D-shaped towers sporting a delightful array of arrow loops and murder holes. Note the rushes on the floor. If you look carefully, you can see the holes in the rafters for where thatch was held in place. The slate roof is only about 100 years old. Moss pan in the window, 12th century stone font for holy water in the foreground. The narrow window is called a “Leper’s squint”, where those who were not permitted inside the church could witness mass. 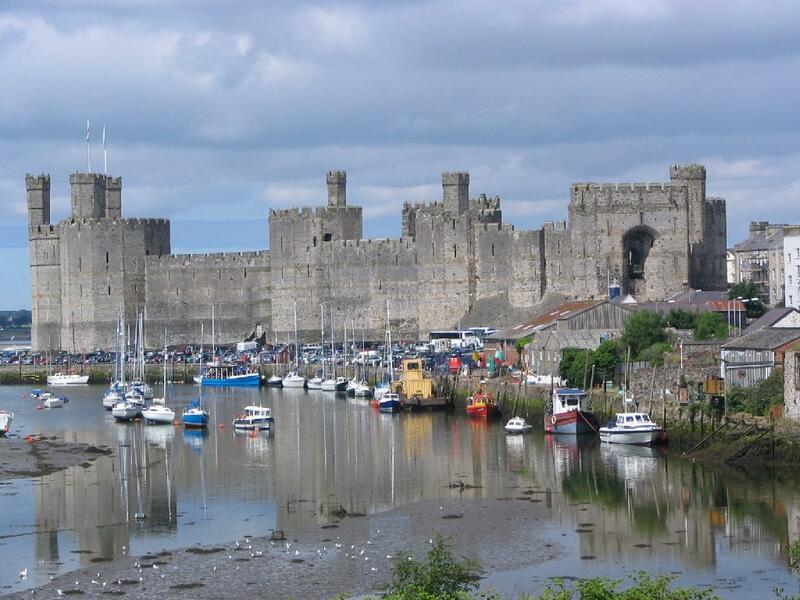 Three weeks in Wales, Part 5: water and old stone. Part 1. Part 2. Part 3. Part 4. “Water and old stone” pretty much sums up Wales, for me, I think. But I have an admittedly biased perspective. Melangell was a female saint of the 7th century. According to tradition she came here from Ireland and lived as a hermit in the valley. One day Brochwel, Prince of Powys, was hunting and pursued a hare which took refuge under Melangell’s cloak. The Prince’s hounds fled, and he was moved by her courage and sanctity. He gave her the valley as a place of sanctuary, and Melangell became Abbess of a small religious community. After her death her memory continued to be honoured, and Pennant Melangell has been a place of pilgrimage for many centuries. Melangell remains the patron saint of hares. It’s a wonderful little place. The 15th century rood screen. Chancel, with the (reconstructed) 12th century shrine of St Melangell. Back of the tympanum, containing a plaster panel with The Lord’s Prayer and Ten Commandments, all in Welsh. My sister and her family before we climbed to the top. Steve, getting some images of the falls, looking down. As he came around past the rock outcrop, the sound from the falls increased. There was the distant rumble from the bottom of the first long drop, but closer now were the sounds of water scrambling over rock and root, gathering in the small pools at the top before the plunge. Darnell made his way to the last of these pools, near the edge of the cliff, and stood there, listening. 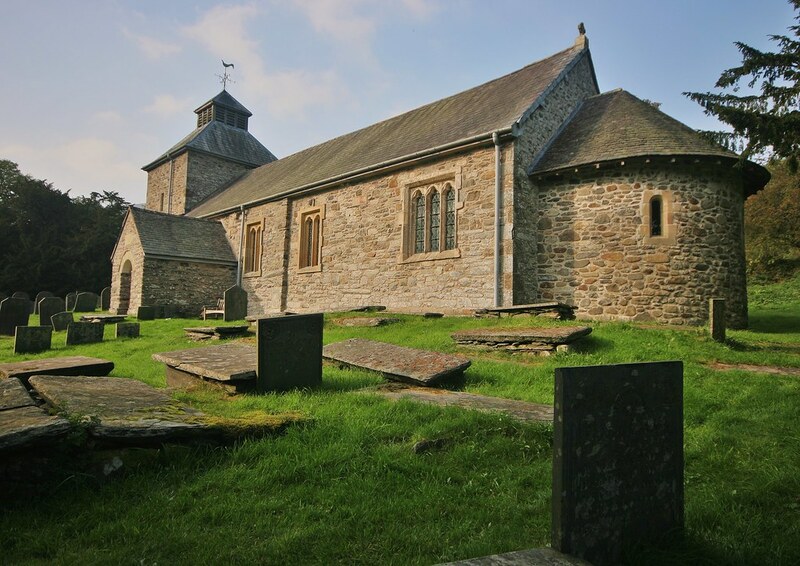 He closed his eyes, took a deep breath, and relaxed, opening himself as he had tried to do at St Cybi’s and St Seiriol’s, allowing rather than reaching, feeling rather than thinking. And he felt something. A whisper in his mind. A whisper as though someone were speaking his name. A whisper of invitation, to step through the wind and over the edge of the cliff, to come to freedom. It was a beckoning, a subtle and supple call to pass through to the other side. This was the thinness Megan spoke of. He understood it now, at least a little. Releasing the breath, he slowly opened his eyes, then knelt down to the pool in front of him. The silver-grey sky reflected in the pool had a new shimmer to it, an intensity he had not seen before. He reached out, as he had done before, and placed the palm of his hand against the surface of the water. There was no slight electric thrill, but neither was there just the crisp coldness of a mountain stream. Rather, there was a vibrancy, almost a … depth … there, more than the few inches of water in the pool would suggest. And while the roar of the falls to his left called loudly, it was the trickle of water coming from his right which whispered to him. He stood, and followed it further up the mountain. The well source, itself, behind the bathing pool.